1. Wash the rice and dal together and add six cups water to it. 2. Add grated ginger, salt and asafetida and pressure cook it till three whistles. 3. In a kadai, heat four tablespoon ghee. 4. When the ghee becomes hot add cashew nuts, pepper, jeera (crushed slightly), curry leaves and fry for about one minute. 5. Add all this to the cooked rice. Mix well. 6. Ven pongal is ready. 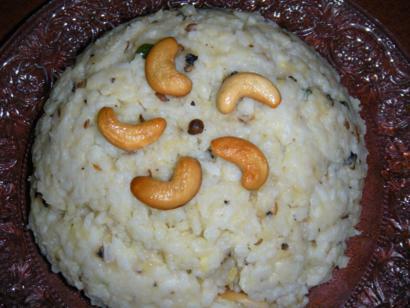 Make it in a round shape, decorate with cashewnuts and serve hot.